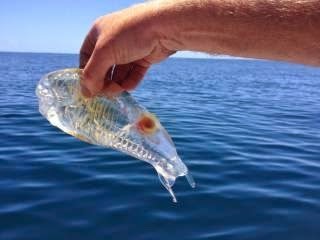 Stewart Fraser caught the unusual fish which was this amazing translucent shrimp-like creature in New Zealand. It was swimming near the surface of the ocean around 70km (45 miles) off the Karikari peninsula on the north island. He said he had never seen anything like it before and had no idea what it could be. It felt scaly and was quite firm, almost jelly like, and you couldn’t see anything inside aside from this orange little blob inside it. Experts believe it could be a Salpa maggiore (Salpa maxima), commonly found in the Southern Ocean.